Don’t let a lack of storage diminish your ebike fun! The brilliant CX2 model from Cyclamatic folds in half for easy storage and transportation wherever you are going. With a more reliable and powerful 250w brushless motor, as well as an upgraded 36v battery, the CX2 has serious ebike credentials but in a form-factor that fits with your life. 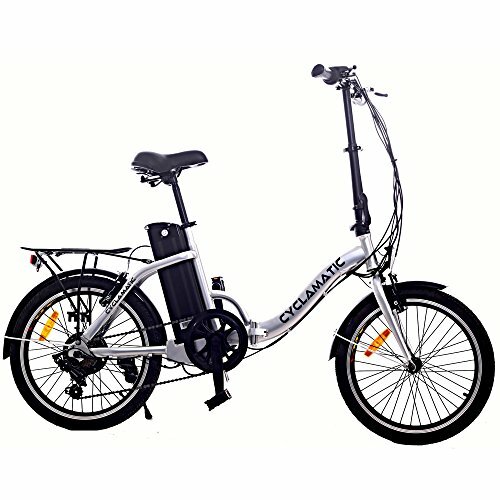 Ideal for travelling holidays and those with minimal storage space, the e-bike folds quickly and easily into an incredibly compact space. The bike folds at a mid-point on the cross bar and the stem of the handle bar with a unique quick-lock-release system. You have the choice of how much work you want to do. Use the bike as a bike with no electric assist at all, choose a partial electric assist mode to amplify your own efforts. Copyright @ ** SALE ** Electric Bike Superstore. All rights reserved.